https://www.tradingdepot.co.uk/polyplumb-polybutylene-barrier-pipe-coil-15mm-x-80m 2115 Polyplumb Polybutylene Barrier Pipe Coil 15mm x 80m - PB8015B https://www.tradingdepot.co.uk/media/catalog/product/p/b/pb8015b.jpg 92.95 92.9500 GBP InStock /Brands/Polypipe/Polyplumb Barrier Pipe /Brands/Polypipe/Polypipe Underfloor Heating/Underfloor Heating Pipe /Plumbing/Plumbing Pipe/Barrier Pipe /Plumbing/Plumbing Pipe/All Plumbing Pipe /Heating/Underfloor Heating Systems/Hot Water Underfloor Heating/Underfloor Heating Pipe/Polypipe Underfloor Heating Coil Barrier Pipe /Special Offers/Plumbing Offers Grey polybutylene barrier pipe suitable for commercial and domestic plumbing use including underfloor heating. 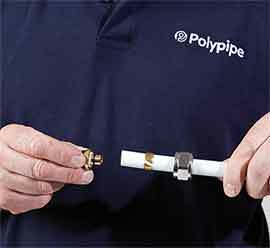 Polyplumb barrier pipe is a flexible alternative to copper tube. It is suitable for both hard and soft water areas and incorporates an oxygen diffusion barrier to stop the ingress of any oxygen in to the system. Manufactured to the highest possible standard this pipe is suitable for use in both underfloor heating and radiator central heating systems as well as domestic hot and cold (potable) water services. 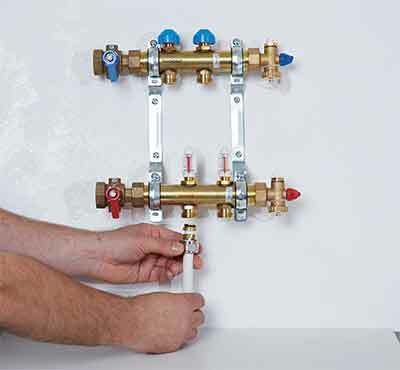 It connects easily to copper pipe using push-fit fittings however please note the polyplumb system is not suitable for the transportation of gases..
Polybutylene pipe is used to create the most flexible jointing systems. It offers exceptional durability and long term performance which has made it become the preferred material choice for today's building projects. Another key advantage of Polybutylene pipe is that it is extremely lightweight compared with the copper piping systems. Polybutylene pipe has a good resistance to freezing temperatures, maintaining long term durability in heating and water applications. 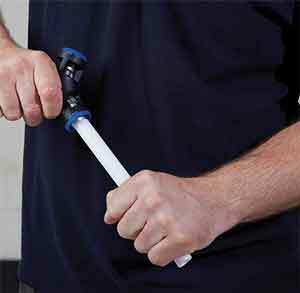 This combined with the flexibility of the pipe, means that if water is subjected to freezing temperatures, a burst pipe is less likely. Polypipe guarantees for 25 years against defects in materials or manufacture of Polyplumb hot and cold water supply and heating systems from date of purchase. When cutting the Polypipe pipe make sure it is not scored or scratched in any way. 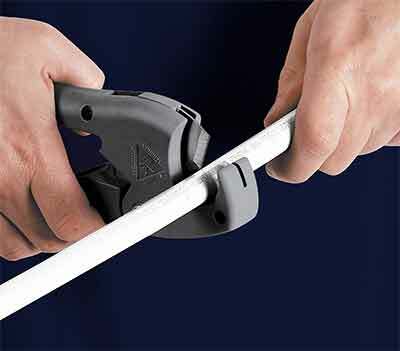 A polypipe pipe cutter must always be used (PB781). The pipe is to be cut squarely using the "K" marks on the pipe as a guide. The "K" marks indicate when the pipe has been inserted into the fitting correctly. Insert the pipe into the fitting, ensuring it is inserted to the full socket depth denoted by the next "K" mark on the pipe. A quick tug on the pipe will confirm that the pipe is interted past the grab ring and that grab ring was present in the fitting. It does niot however ensure that the pipe is fully inserted as this can only be confirmed by using the depth insertion mark. Please Note: Do not re-joint. If a joint has been dismantled, it should not be re-jointed as there is a risk that the outer edge of the grab ring will have become damaged and this will reduce the pull-out performance of the joint when subjected to pressure.